Back to the grind that can be house tours. 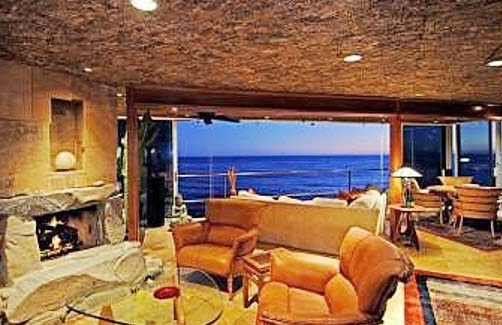 The final home was in Malibu. 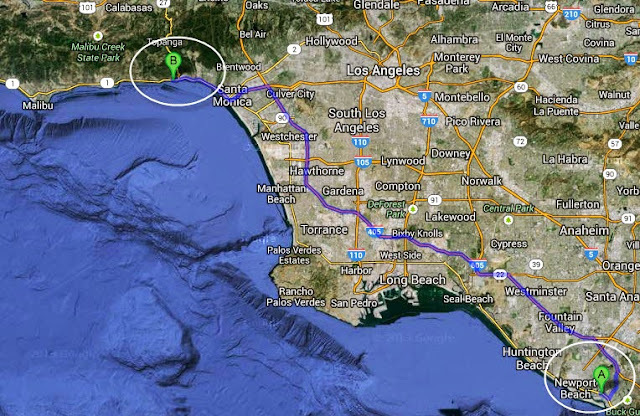 Malibu is located 61 painful to travel miles north west of my home. As I had already seen four homes in the Santa Monica/Venice area, I had second thoughts about making the the drive between Santa Monica and Malibu for the final home as Pacific Coast Highway is notoriously bad on a summer Saturday afternoon. I dug deep and soldiered on. 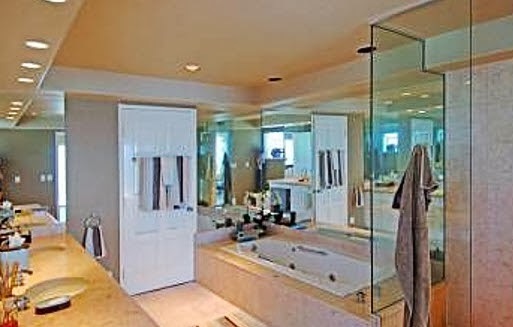 Let's start with the before pictures from Zillow. Go ahead and click. This duplex was constructed in the eighties (**blech**). And, because it was part of a duplex, the owners really couldn't do much with the footprint of the home. UGH. Seriously? I think the eighties were the modern equivalent of the Victorian age. And, I think that is yet ANOTHER Noguchi coffee table. I keep spotting them everywhere. Mental note: do not buy a Noguchi coffee table even if I really, really want one. The horrible bathroom. Pink marble. Not much to look at from the street. Right? The house was covered in this cool blue subway tile you see up on the ceiling of the entry. Nice bright blue door. Favorite color green for a mailbox. Here was the surprise. This home sits right on top of the Pacific Ocean. Is that safe? Is it wise? How long will it last? The experts say not long, but I was dazzled. Heaters for those cold ocean evenings. That means this family can really enjoy their patio. I wanted to hate this house. All its just so touches of hipster industrial chic. But I couldn't do it. Look at that Kelly green pop of color. I was told the floor was coated with the same type of epoxy they put on industrial garage floors and such. How can you hate people who proudly display their mint Kitchen Aid ? Or their chartreuse La Crueset? This may be one of those annoying chalkboard walls but without the chalk. But maybe not. If I ever paint chalkboard paint on anything, just shoot me. Important people have full security. At this point I was wondering, "Who owns this place?" Referring back to the brochure, it said "The Gould Residence." I think this is Howard Michael Gould who is a writer, producer and director with lots of credits to his name. This is a cool room for kids. This may be a vacation home but not sure. It has a look of being able to sleep a few families. It was certainly staged nicely. I totally appreciate tidiness and homes being set up for a tour. Really, who wants to see your dirty towels hanging on the bar? No we don't like reality or that lived in look. Thank you very much. EXCELLENT red computer desk. I want that. This looks like the exterior tile again. This is the kids' shower I believe. I may have switched to an adult bathroom. 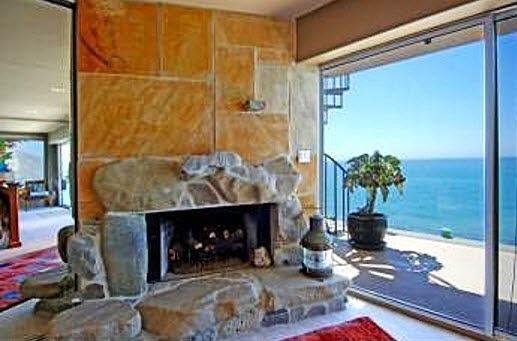 Look at the view from this bedroom. Wow. The architect on this project was Bruce Bolander who has extensive credits to his name. And is extremely famous, I am pretty sure. Up the stairs we go. There was nearly a bedroom on every level. The home may be actually kind of small (by Hollywood standards) due to its vertical nature and the small size of each floor, but it felt like it went on forever. This may be the master. Not sure where this exterior staircase goes. Maybe down to the beach. Sure is pretty. The exterior door appears to be a way to get to the rooftop deck without passing through the bedroom. The tile in this bathroom was extraordinary. Kind of Spanish and kind of mid-century modern. Stairs to a roof tippy top deck. I did not peek. I love a tidy laundry room. This is kind of the other reason I suspect this is a vacation home. Whose laundry room cabinets look like that? Even for home tours? These bright blue chairs kinda look like recovered vintage to me. Really awesome with the orange table and pillow. Nice. Huh? Simple. Great lines. Wonderful color.Bright and really cheerful without being too Crayola. Exquisite furniture but not over the top crazy museum-looking. The whole place came off as very wash and wear. In an expensive way. It was worth it don't you think? You're welcome. I'm glad you made the drive for this one. Very nice! I think that ladder to nowhere is actually an escape ladder, in case of fire. At least I think that's why it's right next to the balconies. I think you are right! It is the fire escape for the other duplex. Like the simple lines. Who needs fuss with the whole Pacific Ocean as the back yard. The framed phrases are interesting, though it's more about balance, I tell ya'! Anyway, the bathroom's vertical tiling is unique to me, and really works well...better than most of the house. The deck overlooking the Pacific - clear railing, chaise lounge, and succulent planter - a great end to it all.